It’s been a while since my last pixel art tutorial (over a year! sorry guys! ), in which I introduced the basic ideas of animation. It’s time we dive into animation itself, and we’re going to start off by looking at one of the most important animations in game development: the walk cycle. We’re going to be looking at the side view walk cycle (the front and back cycles will be explore in the next tutorial). Why? Multiple reasons. For one—it’s the most complicated, from a pixel art perspective. It typically takes more time to create the side view walk than the front or back views (the front and back walk cycles are easier to “cheat”). Animation is a huge topic, and I’m not going to pretend to cover everything. This tutorial is only going to cover a few of the most basic ideas that will be important going forward in pixel art—if you’re interested in animation (and even if you’re not), you should search around for more detailed articles (or books) about animation. Watch any old school cartoon (Mickey Mouse, Looney Tunes) and you’ll see the following techniques used all over the place. 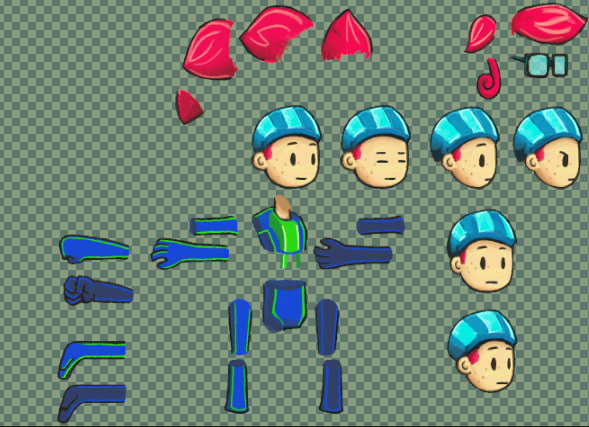 Animating for pixel art is different from traditional animation because you won’t be animating entire scenes at a time—most of the time you’ll be working with individual sprites: characters and objects. But the useful tools and principles are the same. The following techniques are used to give an object weight.